Hotel Hyphen Grand is a 4 star luxury hotel located in SIDCUL, Haridwar. The hotel is serving as ideal place to stay for business travelers and tourists. The hotel has all amenities that makes your business trip stress free and successful. 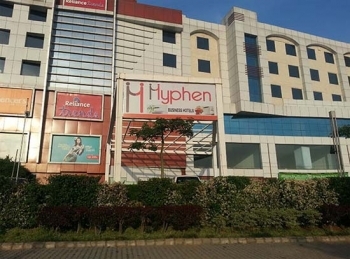 Hotel Hyphen Grand is a venture of Supertech Group. Well equipped Board room, an open tarrace garden and a restaurant is situated within the hotel. So guests does not have to roam anywhere to organize business meets and parties. One can also satisfy their appetite as delicious meals are served in the Restaurant. Some interesting places to visit in Haridwar are located close to the hotel such as Mansa Devi temple, Chandi devi temple, Har ki Pauri, Raja Ji National Park, Chilla Dam etc. You can also plan a visit to excursions like Rishikesh (19 Kms) and Mussoorie (82 Kms). The hotel is located adjacent to Pantagon Mall in Haridwar, at a distance of 120 meters from Kyrbi Plaza. The hotel offers 93 well appointed rooms divided in categories like Deluxe, Executive, Club and Premium rooms with modern amenities like AC, LCD TV, Telephone, WiFi, attach bath with modern toiletries, work desk, refrigerator etc. The hotel has a restaurant named Cafe Treat, with high standard facilities and services. You can enjoy mouth watering meals in the restaurant to satisfy your appetite. SPARX-The Bar is also open now at Hotel Hyphen Grand Haridwar. - AC rooms, WiFi, LED TV with cable connection, Telephone, hygienic bathrooms with running hot/cold water. - Tea & Coffee Maker, Refrigerator, Travel Desk, Money exchanger, Electronic lockers on request. Shivalik, an open tarrace garden is an ideal space to arrange grand celebrations, seminars, conferences and workshops. The capacity of Shivalik garden is up to 200 person and backed by AV equipment on site which includes LCD, monitors, & DVD, Flip Chart, Screens & Projectors. Newly open Bar in the hotel serves wide range of spirits and mocktails. The hotel has two Board rooms-Premimum 1 with a capicity of 50 pax for big meetings and Premium 2 with a capicity of 8 people for small meetings.has modern high tech facilities to conduct successful conference. By Road: SIDCUL, Haridwar being an industrial hub is well connected by motorable road. It is located at 10 kms from Haridwar near Roorkee Highway. Regular buses are available to Haridwar from major cities of North India. Jolly Grant Airport in Dehradun (35 kms) is the nearest airport to reach Haridwar having daily flights between Delhi and Dehradun. Jwalapur & Haridwar Railway Stations are nearest rail link located at 7 km and 11 kms respectively.